I think one of the best parts of being a special education teacher is being able to cook in your classroom! Seriously though, cooking is an important life skill for all of our students to have. Being able to independently make a snack or a meal is HUGE for our kiddos. Plus, there's so many other academic skills that can be worked on while cooking, such as reading, math, and language! Not to mention that cooking (and food) can be super motivating as well. In a perfect world, we would all have a kitchen to practice these skills, but unfortunately I know that is not a reality for every classroom. But, you can still cook! Here's some creative ideas to make cooking a reality for all classrooms. Make it portable: Bring small appliances such as microwaves, blenders, griddles, toasters, etc. into your classroom. Either bring them in from home on the days you will be cooking or see what you can find at thrift stores/garage sales or ask for donations to your classroom. A mini fridge would be great as well! You can do a ton of real recipes using microwaves, blenders, etc. But if you really want to use the stove or oven, keep reading! 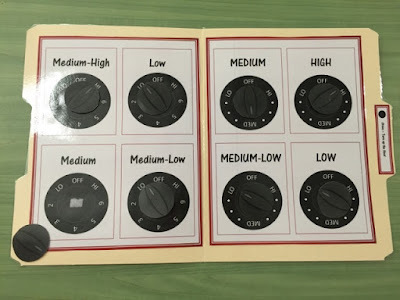 Use your school resources (cafeteria): For recipes that use the oven/stove, talk to your cafeteria staff and see if there is a time they would be willing and able to help you out. Maybe they'd let your class come in, or maybe just one student at a time, or maybe your class could prepare the food in your classroom beforehand (such as mixing up the cupcakes) and then bring it to the school cafeteria/kitchen and they could bake it for you. (You can always tempt them by promising them some of the cupcakes!) It can't hurt to ask! Use technology to role play / pretend: Use cooking tutorials on websites such these food and cooking tutorials on GCFLearnFree to practice the steps of using mixing and using an oven. I love that this one will have the cake turn out poorly if you set the timer wrong! I bet there are some good cooking iPad apps too! 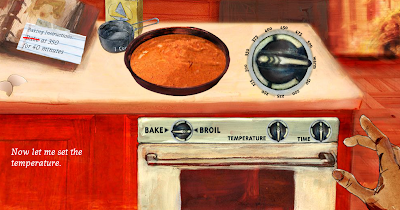 Cooking "Homework": You could also practice various cooking skills and review recipes with resources like the interactive books above, and then send home a visual recipe for the students to prepare at home with their family. This is also a great way to get the family involved. 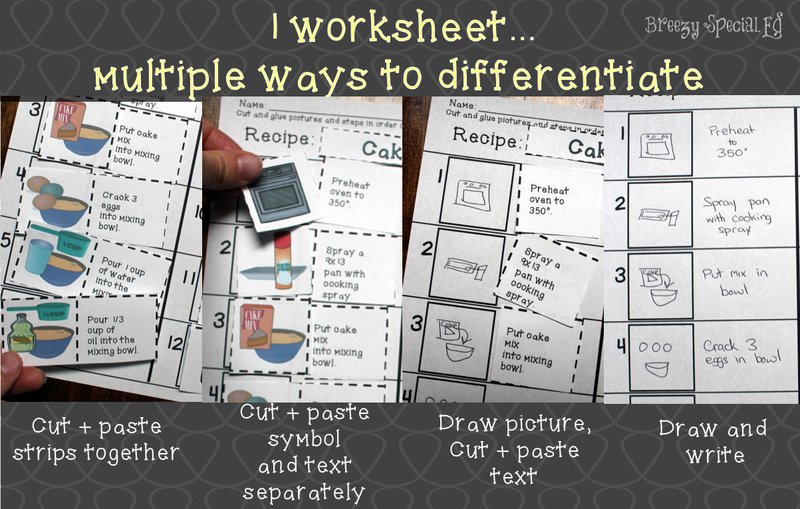 Worksheets and File Folders: Incorporate some desk work into your cooking lessons when you can't use the kitchen. 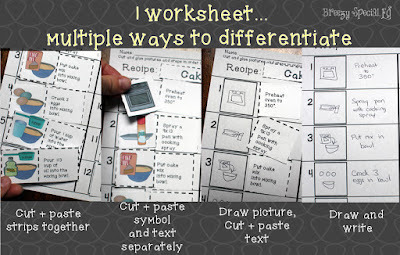 All of my visual recipes have sequencing worksheets that can be used for multiple levels as seen in this picture below. I also love using these measuring cup and spoon worksheets and there's a ton of kitchen life skills to practice in these file folders! Bake at home: Have your students make the recipe up to the part that requires baking. Then you take it home to bake and bring it back the next day! 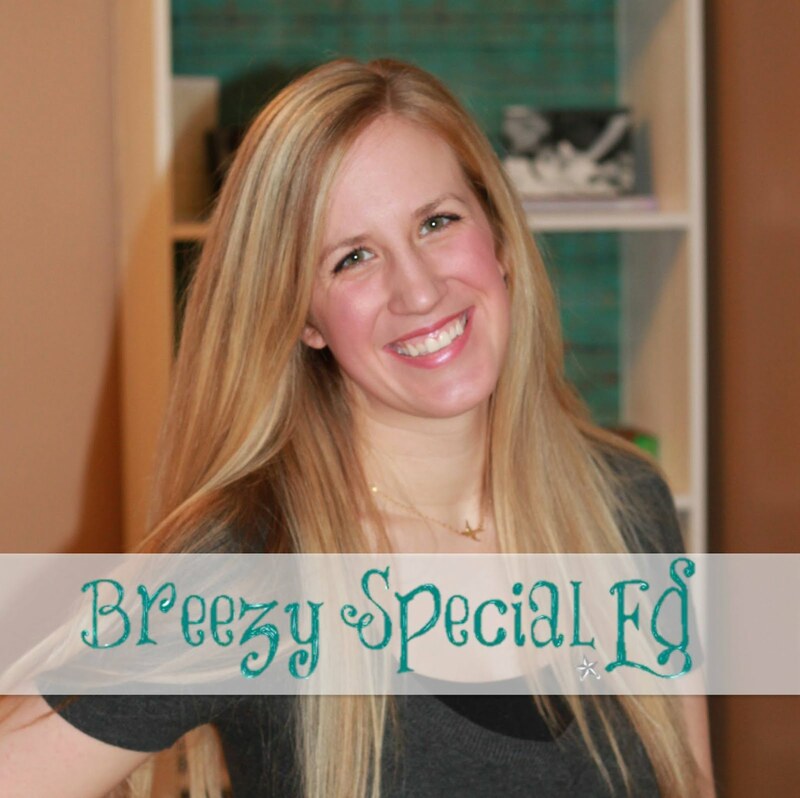 How fun would it be to mix together a birthday cake and then frost it together the next day?! (I could also see a morning talk show type of thing going on here where you take the cake to the "oven", set a timer to make it realistic, and then go get the cake from the "oven" (that you had made the night before)...ta da! Brainstorm with administration: Talk to your principal and staff and see if they have any suggestions on how you can get your students cooking and practicing these important life skills! I hope that gets the ideas flowing! 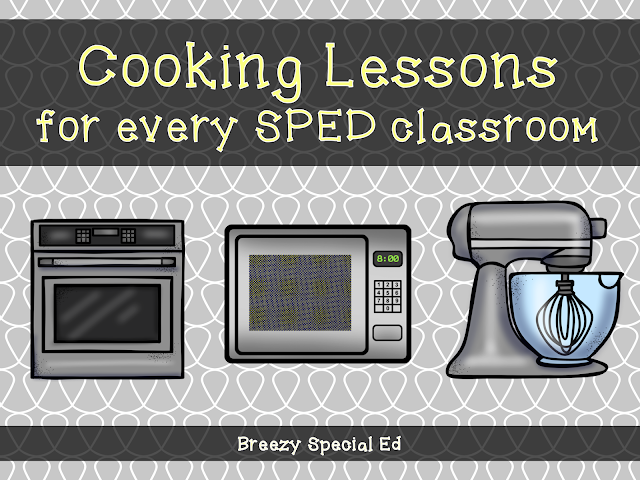 Let me know how you do cooking in your classroom? Are you lucky enough to have a kitchen or do you get creative? Great post! I teach self-contained behavior classes and I have enjoyed cooking with my students for years. I've been amazed at the lack of understanding many of them come with. I had one junior in high school who thought that you should butter the bread before putting it into the toaster. Most of my students enjoy learning to cook and really get a sense of accomplishment out of creating a dish. It can be a really fun relationship-building activity, and hopefully gives them skills to take with them. I've brought some cooking gear from home and got some other pieces (like a countertop convection oven) at a local thrift store. Please check out my blog on teaching students with behavior and emotional disabilities at intelligencepluscharacter.org.